The legendary comic-book illustrator and writer, who died in June at the age of 90, infused characters like Spider-Man and Doctor Strange with a revolutionary sort of humanity. Near the end of The Amazing Spider-Man’s ninth issue (published in 1964), the costumed hero finally figures out how to stymie Electro, the bad guy of the month, by soaking him in water. “Life sure is funny!” Spider-Man says. “Here’s one of the most powerful criminals of all time! And what finally beat him?? Just a dousing from a plain, ordinary water hose!” He then goes to remove Electro’s mask, but is disappointed by the result—under the costume, Electro is just a regular-looking man. “If this was a movie, I’d gasp in shock and then I’d say: ‘Good heavens! The butler!’ But this guy I never saw before,” he muses. The issue is credited as being written by Stan Lee and illustrated by Steve Ditko, a legendary, mercurial artist who worked at Marvel Comics for roughly a decade starting in the mid-1950s. The reality was somewhat different—while Lee wrote the dialogue and helped develop the story of every issue, Ditko was Spider-Man’s chief plotter, drawing each issue and then handing it to Lee to fill in the words (a comic-writing approach dubbed “the Marvel method”). Lee was always the public face of Spider-Man, as he was for all of the Marvel heroes he helped create in the ’60s. But Ditko, who remained a recluse up until his death on June 29 at the age of 90, was just as pivotal to crafting the “ordinary guy” spirit of his most famous creation. The panel depicting the unmasking of Electro is a perfect illustration of the creative push and pull that made Ditko’s collaboration with Lee so fruitful, but that ultimately drove them apart. 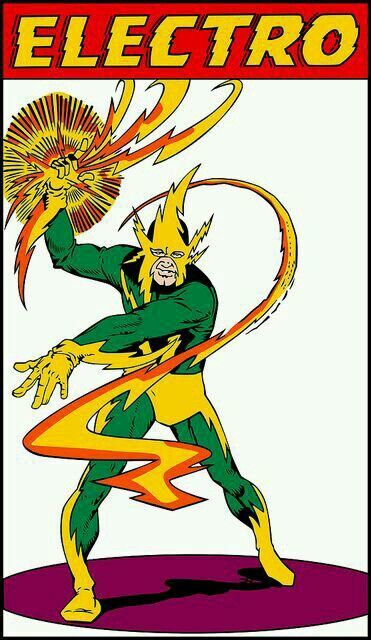 Electro is a classic Ditko villain, drawn in a garish green costume adorned with yellow lightning bolts. But behind the mask is a regular Joe—Maxwell Dillon, a worker on the power lines who gets his abilities in a freak accident. To underline these humble origins, Ditko drew a panel where Dillon’s mask is ripped off. Lee, baffled that Ditko included that moment, has Spider-Man remark on the pointlessness of the reveal. That scene embodied a revolution Ditko helped push at Marvel: Spider-Man was a hero a world apart from his wealthy, costumed counterparts Superman and Batman at rival DC Comics. He was a regular teenager, treated like an outlaw by the public, struggling to pay rent and keep his head above water, bullied at school and plagued by bad luck. 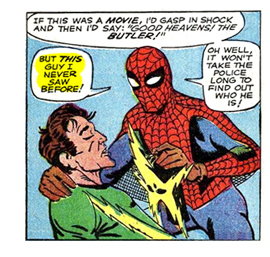 Even catching and unmasking a bad guy like Electro would feel anticlimactic at times—which was a core tension for Ditko’s Spider-Man that helped him stand out and become one of Marvel’s top-selling heroes shortly after his 1962 launch. Spider-Man was created after Lee asked his regular art collaborator Jack Kirby to come up with a teenaged hero that young readers could relate to. Uninterested in Kirby’s initial pitch, which Lee reportedly found “too heroic,” he turned to Ditko, who came up with a red costume that covered the hero’s entire face (a rarity at the time). The comic was an instant sensation, and Spider-Man remains the character for which Ditko is best known, though he also created Doctor Strange (along with Lee) at Marvel and many other famed heroes (like the Question, the Creeper, and Captain Atom) elsewhere. Since Ditko almost never gave interviews, there’s no definitive answer as to why he left Marvel in 1966 at the height of his success, four years after co-creating Spider-Man. But one reason often cited is his disagreement with Lee over the identity of another villain, the Green Goblin. Like Electro, Ditko wanted the bomb-throwing Green Goblin to be a nobody, while Lee insisted that he be revealed as Norman Osborn, an existing character. Ditko left Marvel after Issue 38 of The Amazing Spider-Man, on short notice and with little explanation. Osborn was unmasked as the Green Goblin just one issue later. “Steve wanted it to be someone that no one had seen before,” Ralph Macchio, an editor at Marvel, says in the wonderful BBC documentary In Search of Steve Ditko. “Because he said, in real life, chances are if there was somebody like this, you wouldn’t know who it was. But Stan felt, for dramatic purposes, if you reveal who the Green Goblin is, it has to be someone in the cast.” Lee’s decision was a fun dramatic twist, straight out of the soapy formula that helped Marvel transform superhero storytelling. Ditko’s ostensible line in the sand was a bizarre and telling example of his strict principles and of his emphasis on realism even within the technicolor pages of comic books. Peter Parker, Spider-Man’s real identity, was a reedy, bespectacled high schooler. His angst revolved around unfulfilled crushes and the ill health of his caretaker, the kindly Aunt May. He didn’t fight world-threatening cosmic villains, but costumed bank robbers and street thugs like the Vulture or the Sandman; his most famous enemy (along with the Green Goblin) was Doctor Octopus, a pudgy older scientist. But they all were still frightening to behold, and once in costume, Peter was also transformed into something alien and fascinating. Better than anyone, Ditko could demonstrate the power of an alter ego. “There was a kind of tormented elegance to the way that his characters stood, the way that they bent their hands,” the comics legend Alan Moore says in In Search of Steve Ditko. “His characters always looked very highly strung. They always looked as if they were on the edge of some kind of revelation or breakdown. There was something a bit feverish about Steve Ditko.” That vibe applied to Ditko’s other hit book at Marvel, Strange Tales, where he co-created a touchstone hero of early psychedelia, Doctor Strange—a surgeon-turned-sorcerer who journeys into parallel “nightmare” dimensions. After Ditko left Marvel, he never experienced the same kind of success, though his Charlton Comics hero the Question (created in 1967) remains a cult favorite, eventually absorbed by DC Comics. The Question was a ruthless, faceless detective who dressed like a noir hero and brutalized criminals. Free of Stan Lee’s high-spirited, swinging-’60s liberalism, Ditko was more comfortable using comics to assert his belief in Ayn Rand’s Objectivist philosophy. 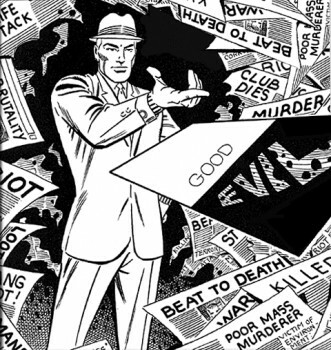 Another of his creations, Mr. A (also created in 1967), wielded a black-and-white business card that represented the stark difference between good and evil, with no gray area in between. Mr. A, who spoke in long, polemical rants, was not a hit with young comic-buying audiences, but Ditko would return to him over the years, expressing his political beliefs in the power of the individual over all. Moore based his antihero Rorschach, one of the stars of his classic series Watchmen, on Mr. A and the Question—Rorschach is an absolutist who despises criminality, dispenses violence with practiced ease, and would rather die than betray his moral code. In the BBC documentary, Moore chuckles while recalling that Ditko caught wind of the homage and remarked that Rorschach was a lot like Mr. A—except the former was insane. Ditko worked in obscurity for decades as his biggest creation became the centerpiece of Marvel and the star of some of its biggest films. He occasionally freelanced for Marvel in the ’70s and ’80s, as well as working in independent comics. He worked out of an office near Times Square, never marrying, politely declining interviews, and paying the bills with commercial work (“Seeing samples of his Transformers coloring book and his Big Boy comic is like hearing Orson Welles sell frozen peas,” wrote Douglas Wolk in 2008). But though Ditko never quite reached the artistic or financial heights of his Marvel work again, his influence lingers in the building blocks of all superhero storytelling. For a hero to work, they have to be strange or eye-catching in some way, while still possessing a recognizable glint of humanity. Ditko’s heroes and villains could be terrifying while also harboring some deep inner pain; they could be philosophically objectionable but undeniably alluring in their devotion to some form of justice. They were otherworldly characters who might stalk the street alongside you.